Judge 1: I love the coloring in this piece. Red is my favorite and I love the dimension of the flowers and the reflections of the mirrors on the flowers. My least favorite part of the piece is the lower right corner. I think the stripes get heavy here. That is something that is unseen in convergence before hand but maybe could have been broken up with a flower? Judge 2: I love the gigantic print used in this piece, and the interesting convergence effect with the stripe. 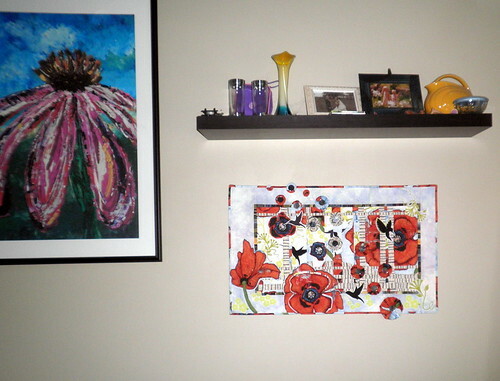 The piece has a lot of movement, bright color, and plenty of interest. 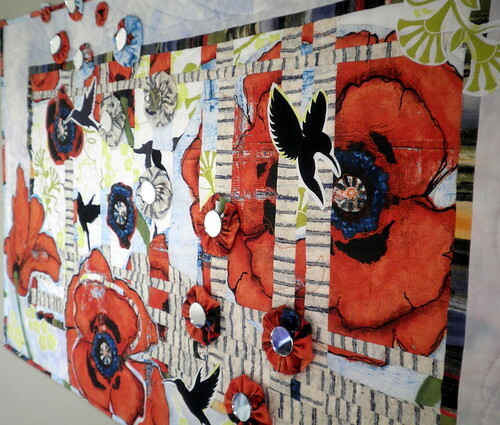 To improve this quilt, I would have liked to have seen additional editing in the binding and appliqué placement. 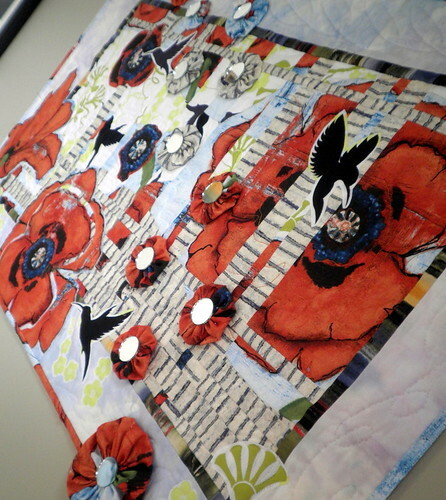 I think the quilt would have benefitted from a solid binding, to anchor the piece more. A light color to blend with the borders would have given the illusion of no boundaries, and a darker binding would have given a substantive frame. With the binding alternating from dark to light unexpectedly gives a more broken feel to the piece that interrupts the visual space. To make the chosen binding work better, I think the appliqués and three-dimensional pieces would have had a more pleasing effect to the eye if more of them “exited” the boundary of the quilt in those lighter spots. As it is, the appliqués seem to be halted or constricted by the artificial boundaries. Overall it is still a very lovely piece. Judge 3: I love this. You’ve added just the right amounts of appliqué and the yo-yos and mirrors are perfect. Great job!!! Judge 4: Your concept is very bold and brave, using such a large print for a fairly small piece! The convergence technique with asymmetrical strip widths exudes a lot of energy, and the contrasting striped pieces add a lot of punch. 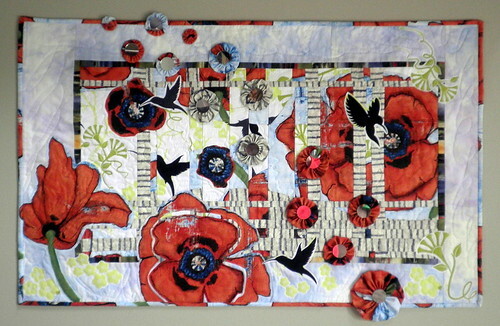 I love that you used large fussy-cuts of the flowers and hummingbirds to create a story within the activity. The mirror elements in the 3d yo-yos add a cool element of surprise. Another excellent piece! I love it Kim. 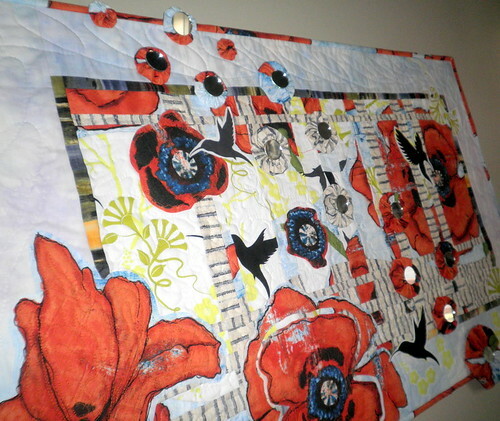 It is very playful and keeps your eye moving around the quilt.